Taking a temperature of a sick child is sometimes a difficult task to do. Because they won't settle the way we want them to be, it turned out that we can't get an accurate body rate temperature. I remember during my childhood days the old technology of getting one body's temperature. They have a thermometer that needs to be placed in the armpit, make sure the person is settled or it will be the incorrect reading. Others usually put it on the bottom or in the mouth. Glad I have an opportunity to review a non-contact infrared thermometer from Santa Medical. The item arrived in the mail through the UPS and can be purchased here. The packaging is great, I don't see any signs of damage in the merchandise that I was able to use it right away. All the kit that is included in the product seems to be complete. It comes with 2 AAA batteries, a pouch to keep the thermometer safe, a manual that keeps all the details about the product and of course the Thermometer itself. No tools needed, after I put the 2 AAA batteries, a short beep sound turned on, I guess this would show that the thermometer is ready to use. There is a sound button for ON and OFF button on the side in case you don't want any sounds at all. The scan can be located in the front, easy to use all I did is to gently press that button and aim the infrared to the forehead of my son and it gives me an accurate body temperature right away. It is seconds that I have a quick displayed result in the monitor. The thermometer will shut off itself after less than a minute that you won't use it. Also, I have noticed, the light also turns off after the result is displayed. One thing I like is that it can keep a previous reading, unless you change a new battery and all the reading will be removed. Also the thermometer itself is also not too big that you can carry it anywhere without being too bulky. For the Price of $44.95 I say, it is worth to purchase the product. I'd like this kind of thermometer, a non-contact and gives me an easy result in a body temperature. 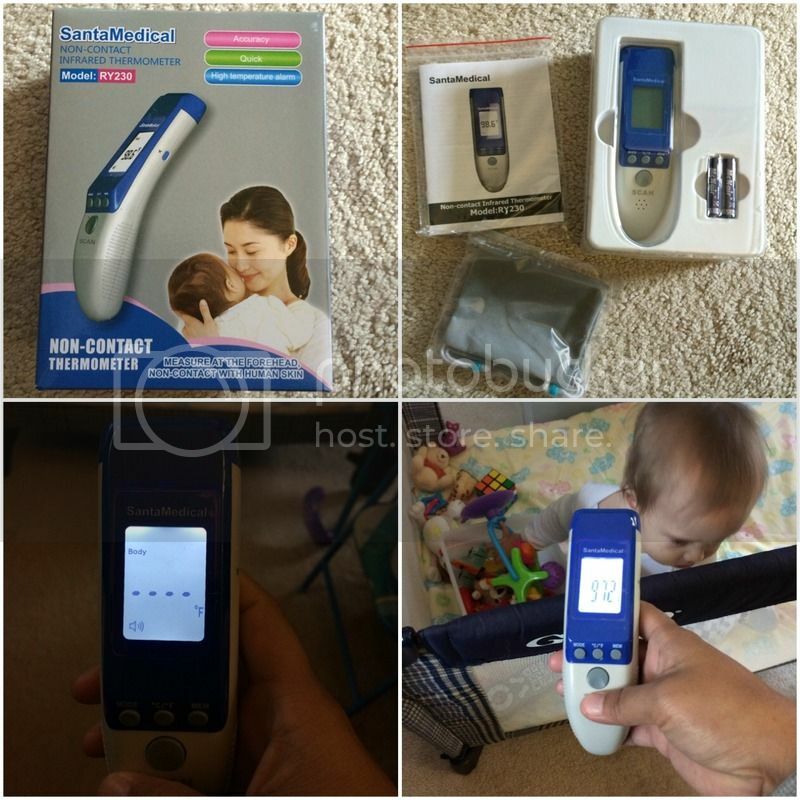 SantaMedical Infrared Thermometer best child care medical devices. I have one at home and I think it's the best. No need to worry where to put just to get an accurate temperature! A ood thermometer is a must especially if you have kids. MY kids both have high fever last night and glad we have a food thermometer.